Totally legal and permanent unlocking service. Unlock your BLU with doctorSIM quick and easy. 100% online; the phone never has to leave your side. Unlock your BLU keeping the phone's warranty. How to unlock my BLU phone with doctorSIM? To unlock your BLU all you need is its IMEI number by typing *#06# on the phone's keypad and the name of the network carrier to which the phone is locked. With the information provided, we will scan multiple databases located across the world for your unlock code and then send it to you along with step-by-step instructions on how to finalize the unlocking process. Does unlocking my BLU cell phone void the warranty? Unlocking by IMEI does not void the phone's warranty. In fact, because you are typing in a code, no software downloads or hardware modifications are required. Your BLU phone is in safe hands with doctorSIM. How do I know if my BLU has been reported or blacklisted? Reports are additional security measures which prevent the phone being used properly and are not removed by unlocking the device. 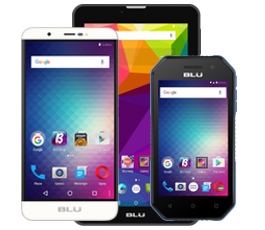 Check now if a BLU phone is blacklisted. Contact the original carrier to remove the phone from the blacklist and then you can unlock your BLU cell phone with doctorSIM. Why should I unlock my BLU phone with doctorSIM and not in a local store? The unlocking method used by doctorSIM is recommended by BLU and the rest of phone manufacturers. It is legal, permanent, and keeps the phone's warranty. Additionally, you don't have to leave your phone at the store because you unlock the phone yourself by typing in a network unlock code. Is BLU unlocking 100% legal? Our method of unlocking phones by IMEI is perfectly legal. In fact, this method is the only one recommended by the phone manufacturers and carrier network themselves. Can I still unlock my BLU phone if I don't know the exact model? Yes, you can! You don't need to know the exact model of your BLU as our instructions are valid for all models. The difference is the unlock code will be unique to the cell phone's IMEI number. Will I be able to use my BLU smartphone on any carrier in the world if I unlock it? Once unlocked by doctorSIM you'll be able to use your BLU on any GSM carrier in the world as long as it has not been blacklisted due to loss, theft or non-payment. Our unlock method via IMEI is permanent and the phone will never relock even with software updates. How long will it take to unlock my BLU phone? The guaranteed delivery time will be displayed once you have selected the country and network provider. You will also be able to see the average delivery time of the last 20 unlocking requests once you have filled in the information required to process your unlock code. We are a legally registered business. Use your BLU on multiple carriers around the world. You don't have to part with your device while we unlock it. No technical skills required to insert the network code.